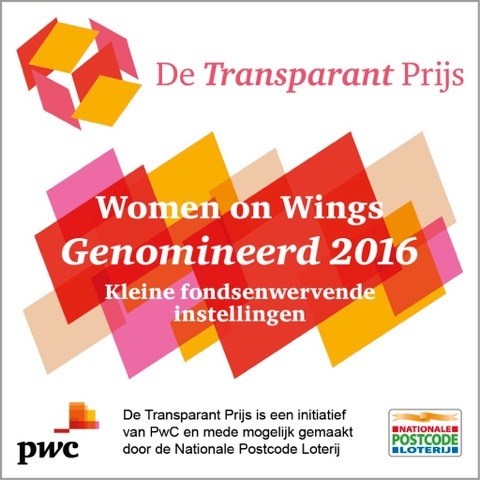 Women on Wings ranked second in the category ‘small organizations’ of the Transparency Award in the Netherlands. The Transparency Award is an initiative of PricewaterhouseCoopers (PwC) and awarded annually to Dutch charities and social enterprises that communicate best about their social impact. The jury assessed last year’s annual report and website of 135 charities and 13 social enterprises. Women on Wings was nominated in the top-3 in the category ‘small organizations’ and competed against Heifer and Mama Alice. Heifer won the first prize, which includes a donation of 15,000 euro. The Transparency Award was organized for the thirteenth time and operates with the support of the Dutch Postcode Lottery. The jury looks at criteria such as compliance, social outcome accountability and communication. The criteria are in line with the requirements of the qualification system for charities in force in the Netherlands since early this year.